When the number of students at Hawaii Pacific University started to fall at an alarming rate, the university embarked on an ambitious plan to attract more. Among other things, it spent $54 million to buy Honolulu’s iconic Aloha Tower and convert it into an anchor for its downtown campus by adding dorm rooms, community spaces, a fitness center and venues for concerts and lectures. To pay for this and other projects, Hawaii Pacific borrowed. A lot. By 2015, the most recent year for which the figure is available, it owed $75.3 million in municipal bond liabilities, plus $10 million in mortgage and other debts, federal tax records show. But student numbers didn’t rebound. Instead, they continued to decline, from a peak of 8,339 in 2010 to 4,081 last fall, according to government data. Now, like many other colleges and universities, Hawaii Pacific has fewer tuition-paying students to help it pay off a large amount of red ink. While public attention has been focused on runaway student loan amounts, colleges and universities themselves are also borrowing heavily — often in the hope of shoring up enrollments, but in many cases leaving them financially weaker, analysts say. Colleges and universities collectively owe $240 billion, the Moody’s bond-rating service reports. That debt rose 18 percent, to $145 billion, in the last five years at public universities, Moody’s says. At privates, it went up 3 percent, to $95 billion. 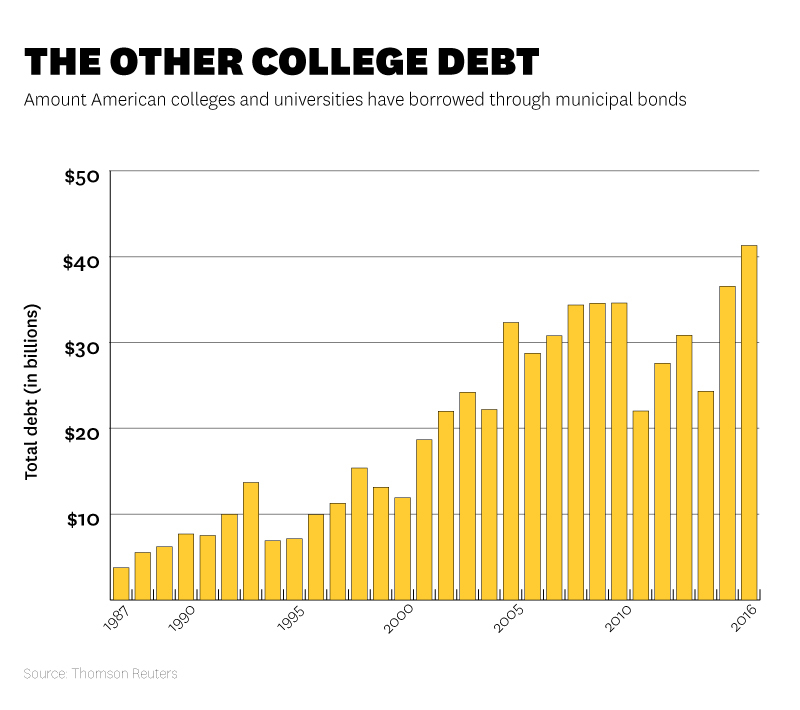 Last year alone, colleges and universities borrowed a record $41.3 billion through municipal bonds, their principal source of debt funding, the financial information firm Thomson Reuters reports. That’s up from $28.7 billion a decade ago. The annual cost of servicing this accumulated debt more than doubled, from $21 billion in 2003 to $48 billion in 2012, the most recent period for which it has been calculated by researchers at the University of California, Berkeley. This means 9 percent of college and university budgets, on average, now goes to servicing debt, a cost that has been rising faster than enrollments. Just the interest payments come to the equivalent of $750 per student per year at public universities, the Berkeley researchers found, and $1,289 at private colleges. It’s reasonable to assume that this is driving increases in tuition, experts say. 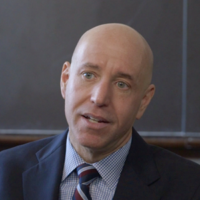 “When you spend more on X, you have to bring in more money from Y, and that Y is usually student tuition,” said Aman Banerji, program manager at the Roosevelt Institute, which among other things studies what it calls the financialization of higher education. One reason for this borrowing is that money is comparatively cheap while interest rates remain low. Interest payments on the money borrowed by higher education institutions come to the equivalent of $750 per student per year at public universities and $1,289 at private colleges. But much of it is happening because — despite budget cuts at public universities, sluggish endowment growth at private ones and falling enrollments everywhere — colleges and universities have continued to build new facilities at record-setting rates. Colleges and universities collectively spent $8.4 billion on new construction and renovations from January through August of this year, up nearly 10 percent over the same period the year before, according to Dodge Data & Analytics, a private company that tracks this. That’s after laying out about $12 billion in each of the last three years. But the idea that these expenditures will pay for themselves by attracting new students may be wishful thinking, observers caution. “Sometimes that doesn’t pan out — the ‘if you build it, they will come’ approach,” said Susan Menditto, director of accounting policy at the National Association of College and University Business Officers. For one thing, with the number of 18- to 24-year-olds declining and students older than 24 being drawn back into the workforce as the economy improves, there were 2.4 million fewer people enrolled in higher education in the academic year that ended this spring than there were in the fall of 2011. And the supply of potential customers continues to fall. Yet colleges keep building. Moody’s reports that new student dorm projects at eight of the 26 universities it studied — it wouldn’t name which ones —created “substantial” or “speculative” credit risk by expanding their campus housing supply more than 25 percent, even though their enrollments were declining. Four of those schools weren’t filling their existing dorms. Borrowing to build new facilities they thought would attract more students has been a particularly bad decision for small, less selective, private nonprofit colleges according to the higher education facilities consulting firm Sightlines. Like Hawaii Pacific, many have merely ended up with more debt and fewer students to pay for it, Sightlines concluded. At most schools, the debt burden remains manageable when measured as a share of revenues and assets, Moody’s says. Some of the largest borrowers are wealthy nonprofit universities and colleges, for instance, whose strong credit ratings mean they can borrow at the lowest available interest rates, and whose endowment returns more than offset the costs. These institutions are also the most likely to use their debt for such things as research and instruction, raising their prestige, the Berkeley research found, while less-wealthy schools tend to use it to build dorms and fitness centers they hope will quickly boost enrollment and revenues. Institutions that are barely breaking even, with enrollments that are flat or down, need to look before they leap into debt, Menditto said. “We can only assume that institutions are doing an all-in cost analysis when making these decisions,” she said.